There are five main plywood grades. These grades describe the appearance and plywood strength. A lower grade can mean that the plywood does not resist punctures or hold nails very well. This can lead to an easier time cutting the plywood. The higher grades, however, are fairly strong. Each panel consists of various layers of veneer. 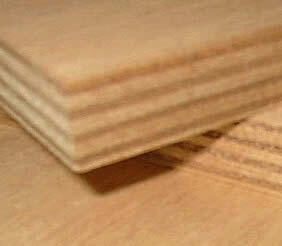 Plywood is similar to chipboard, in that adhesives and pressure are used to form the board. Its strength can be increased if the veneers are placed opposite grained. This will not only cause it to be stronger over all, but also prevent cutting the plywood through if it is used as a work table. The grades run from A, which is the highest, to D. The reason there are five grades in total is because the C grade has two grades: C grade and C plugged grade. The grades specify how many knots and patches and other imperfections the plywood can have. Most plywood is described by more than one grade. The first grade describes the face panel while the second describes the back panel (i.e. B-C grade means the front is B grade and the back is C grade). A- Grade: Grade A is smooth. It can be painted and has a limited number of patches. B- Grade: The B grade is solid, and has a few more knots and may even have very minor splits. C- Grade: Grade C allows for limited splits and discoloration or sanding effects, provided the plywood strength is not affected. C plugged grade plywood is an improved version of C grade. The difference is that the splits and cracks are not as big as those found on C grade. D- Grade:Grade D plywood features knotholes of up to three inches across the grain and even some cracks. This grade of plywood should never be used outdoors, as when it gets wet it will swell and break down. Finply is what manufacturers call Finnish plywood. It is generally more durable and attractive than regular plywood. While many plywood products are inexpensive, finply actually costs quite a bit. It can be combined with aluminum to make very modern looking furniture. Many woodworkers consider the high quality finply boards so special that it gets like a kind of grade on its own.